Traveling south on Interstate 5, take Exit 19. Follow signs about two miles to Ashland and the Shakespeare Festival. Just as you pass the brick Briscoe School on the right, there is a stoplight at Laurel Street. One hundred feet past the stoplight, after a fire hydrant and streetlight, turn left onto Bush Street. Make an immediate right turn into the alley and find reserved parking behind the second building on the right, Ashland’s Main Street Inn. Walk up the asphalt path on the right to the front door. Traveling north on Interstate 5, take Exit 11. 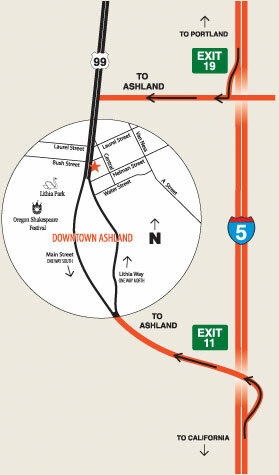 Follow Siskiyou Boulevard into downtown Ashland, about five miles. Siskiyou will first become one-way Lithia Way and then, at Helman Street, two-way Main Street. One hundred feet past the stoplight at Helman, turn right onto Bush Street. Make an immediate right turn into the alley and find reserved parking behind the second building on the right, Ashland’s Main Street Inn. Walk up the asphalt path on the right to the front door.